It is with great sadness that I inform you that my good friend and mentor Geoffrey Russell, passed away on October 3rd peacefully at home. He was the founder, chairman and coach of Salisbury Fencing Club for over 50 years. Geoffrey started fencing when he lived on the Isle of Wight. Later when he was serving in the R.A.F. he wanted to become Master as Arms (best across all weapons), in the combined services championships. At that time, Geoff had to compete with four weapons: Foil, Epee, Sabre and Bayonet! 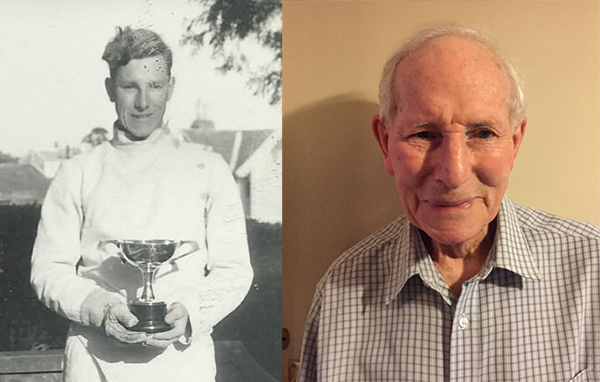 Recently, Geoffrey was honoured with the ‘Outstanding contribution to Wiltshire Sport’ Award. Having shared his passion for fencing as a volunteer for decades and introducing countless fencers to the sport, this was the least he deserved. He will be dearly missed. Our thoughts are with his family. The funeral will be on Monday, 22nd October at 11.30am at Salisbury Crematorium.